We had another amazing Sunday today. Avery seemed to progress leaps and bounds in one day. Okay, she's not leaping and bounding, but she did climb our two steps unassisted for the first time today. She's been going down for a couple weeks now, but up was a first. Then, tonight in the bathtub, she decided to try pulling up to her feet for the first time. She did it about 5 times in a row, slipping and sliding as she went. Normally, I would completely discourage her from standing in the tub, but I had to give some leniency for a first time standing. 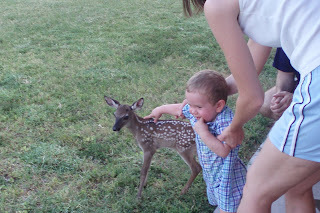 We also went to a friends house this evening to see the fawn in their care. Betsy, a vet, is raising one of two abandoned baby deer found by a game warden. She says they will release him once he grows out of his spots. This little guy is only 11 days old. He's so cute! Betsy's giving him goat's milk from a bottle. Here is Avery's friend, Gavin, getting up close. Oh how cute! I've got to give Betsy a call. 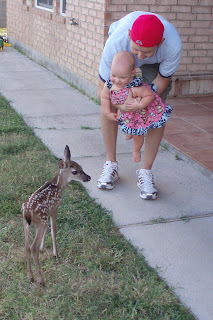 I've never seen a baby deer:) Congrats on Avery's firsts! She is such a doll. We've been going over to Gavin's when we hear Avery's coming for a play date. oh Courtney amazing photos such a rare opportunity...thanks for your sweet comment on my blog.